Hillsdale Community Health Center (HCHC) is a medical facility that has served Southern Michigan communities since 1915. The state-of-the-art facility is a leading healthcare provider offering sophisticated equipment and care to the Hillsdale community and beyond. HCHC consists of the main hospital and three facilities located in the Hillsdale community. As HCHC continues to expand, the need to better communicate has also grown. With a philosophy of serving the community and continually striving for excellence, HCHC was in need of a system to manage communication among staff and between the various departments. In order to provide collaboration among the 400+ employees, “The Loop” provides a central concourse for information, updates, and employee communication. 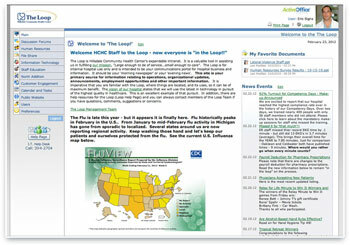 The Loop is a network connecting administration and employees with information critical to the day-to-day operation of the facility. With the click of a button, the administration can authorize employees to access their portion of the intranet, and editing can be done to any part of the website. Communication among internal and outside departments was made possible with Discussion Forums serving each department. Each employee has access to news items, human resources information, staff education opportunities, maintenance concerns, and a calendar of events. 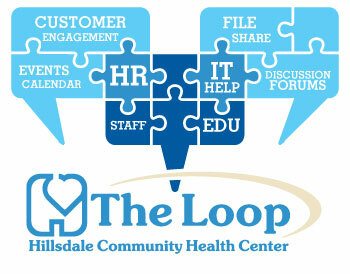 "In a very short time, the Loop has become essential for our day-to-day operations. HCHC applauds Digital Active for a job well done." They have been essential in our online success"